Wouldn't it be amazing if you could offer your corporate learners a 360 view of your online training environment? What if your corporate learners could interact with your online training materials just as they would in the real world? In this article, I'll share 6 tips for using Virtual Reality in your online training courses. There isn't any doubt that simulations and branching scenarios are valuable online training tools. However, some corporate learners may find it difficult to immerse themselves in the situation, especially when there are distractions getting in the way. Virtual Reality has the power to change all of that though. There are no longer physical boundaries standing between the corporate learner and their online training environment, no mouse navigation controls, and no computer screen to serve as a barrier. But how can you use Virtual Reality in online training to capitalize on modern technology and give your corporate learners an online training experience they'll never forget? Virtual Reality in online training gives you the ability to immerse your corporate learners in dangerous situations without putting them in harm's way. For example, you can design an online training simulation that instructs employees on how to handle a hazardous chemical or operate a temperamental piece of heavy machinery. They don't need to worry about making mistakes or trying out new techniques, because they are learning the ropes in a safe environment. That being said, Virtual Reality is the next best thing to real-world training, which allows them to see how they'll perform under pressure. In the "old" days, employees had to overcome learning curves on the job. If they wanted to come up with new solutions to a problem or perfect their approach there was usually costly trial-and-error involved. Therefore, many of them didn't even take the risk and just stuck with the status quo, instead of trying to branch out and indulge their curiosity. Virtual Reality in online training offers them the opportunity to test out new assumptions and techniques that can boost their productivity. They can be innovative and use their lateral thinking skills in order to streamline the work process. For example, IT staff members are able to brainstorm new troubleshooting approaches or try out cutting-edge diagnostic tools. Whatever the task is, they have the power to explore all the steps and come up with their own learning strategy. Virtual Reality presentations allow organizations to train an unlimited number of employees simultaneously. Best of all, they still get all the benefits of "in-person" online training without any of the drawbacks. For instance, you can create a Virtual Learning Environment where employees interact with their remote co-workers, listen to a virtual instructor, and engage in online training activities. All of these things can be done from anywhere in the world, as long as the employee has access to a VR headset and an internet connection. Likewise, you can offer corporate learners one-on-one support, when the need arises, without having to pay for an on-site mentor or instructor. This is ideal for employees who may require more personalized support or are easily distracted. A video conferencing system may be an invaluable tool, but Virtual Reality takes it to the next level by putting them right in the middle of the online conversation. There is a wide range of Virtual Reality applications for online training, especially for newly hired employees. New hires can participate in Virtual Reality simulations, branching scenarios, online tutorials, and group collaboration online activities that offer them firsthand online training experience. All of these things are commonly used in online onboarding training today. However, Virtual Reality immerses them in real-world environments and gives them the chance to explore every aspect of their new position. For example, an HR representative can take a tour of their virtual department, learn all about the employee database, and even participate in an interview simulation. As any eLearning professional will attest, mistakes are only mistakes if you don't learn from them. Virtual Reality in online training is all about mistake-driven learning. Users have the power to fail, try out new solutions, and see where their choices lead them in a risk-free setting. They can see how they'll react in stressful situations and identify performance gaps that are standing in their way. In essence, they have the opportunity to gain valuable online training experience and prepare for every eventuality before they enter the workplace. What do you do if you want all of your corporate learners to tour a historical landmark or remote facilities? You either pay for them to fly there, which can cost a pretty penny, show them an online video that they'll passively watch, or invite them to travel there in a split second by putting on a Virtual Reality headset. Virtual Reality worlds can be based on any location, real or imagined. For example, your employees will have the chance to tour your manufacturing facilities in Europe, even if they are thousands of miles away. They get a better understanding of how your products are made, and then they can pass this knowledge onto the consumer to seal the deal. On the other hand, you can take your serious games to the next level by creating a Virtual Reality version. Corporate learners can explore new worlds, battle bosses, and earn badges while they build their skills. In order to get the most out of Virtual Reality in online training, you should take the time to research all of the devices that are available. Oculus Rift and Google Glass may be the crowd favorites, but there are a number of other players entering the Virtual Reality game. 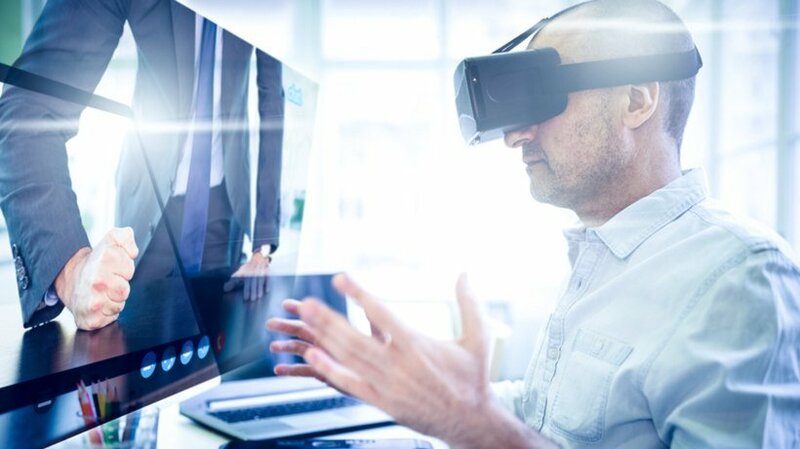 So, figure out which VR platform fits into your corporate eLearning budget and offers the features you need to create cutting-edge VR online training content. Wearable technology is taking the world by storm. Read the article 7 Ways Wearable Technology Could Be Used In Corporate Training to discover ways that it can be used to transform your online training program.